Rhum agricole is type of rum mostly (but not only) produced in the French speaking islands of the West Indies (Martinique, Guadeloupe) or the Indian Ocean (Reunion). It is sometimes refered as "Plantation Rum". For other rums, the sugared solution to be fermented is mostly made of watered down molasses. This specificity in raw material gives rhum a wider bouquet. This is especially the case for white rum (rhum blanc) as in older rums barrel aging tends to smooth down the differences. Fresh sugarcane juice being so prone to oxidation, a rhum agricole distillery can only produce rhum from locally sourced canes. Rhums agricoles have hence a terroir personality in addition to the distiller's craftmanship. Molasse based rums, on the contrary, can be produced anywhere and only reflect the distiller's skills. Most of molasses used to produce rum are sourced from Brazil, no matter where the distillery might be (even in places where cane doesn't grow). Sugarcane introduction into the West Indies. Christopher Columbus is said to have brought sugarcane to Hispaniola in 1493, on his second trip. The crop was then introduced by Spanish armies to other West Indies location such as Cuba and Jamaica. Sugarcane was also introduced on the American mainlands (Mexico, Venezuela, Brazil, ...). Dutch settlers excelled in sugarcane cultivation and sugar production. As Brazil offered such a combination of favourable climate and abundance of fertile lands, the crop rapidly gained importance in that part of the world. On a sad note, we must not forget that this production increase was fueled by a massive supply of African slaves. Not even a century later, the New World had replaced the Mediterranean area as the main supplier of sugarcane. From 1635, French settlers introduced export crops such as coffee or coton into the West Indies. Sugarcane acclimatization was also tested and it was at first cultivated for sugar production. This production did not offer sufficient profitability, due to poor sugar extraction techniques. From sugarcane juice to alcohol. It had already been noted that juice naturally fermented under the climate and ambient yeast into an alcoholic beverage. In 1694, the French priest "Père Labat" got the idea of applying distillation to this beverage. This new step created a spirit which became known as rum. Sugar mills rapidly added a distillery to their facility, offering a profitable use of the by-product : the molasses. Cane wine was then obtained by diluting remains of sugar production (the molasses) with water. Distillation was made through basic equipment where hot alcohol vapours were cooled in vessels running through cold water. Until the early 19th Century, this basic production mode, as described by Pere Labat, was still used. At the beginning of the 19th century, French West Indies rum was suffering from harsh competition from English speaking West Indies islands. Those Islands (such as Jamaica) had acquired unparalleled skills in the rum production process. That technological advance was obvious in the distillation area with a real expertise on isolating distillation body through cutting of fore-shots, heads and tails. The produced rum was hence safer (without any methanol/fore-shot) but also tastier (without most of the acrid tails). Those techniques evolved to reach the devices used today: distillation columns. In 1870, sugarcane accounted for 57% of Martinique arable lands. Sugar cane prices which once rocketed, plunged heavily due to worldwide over production and the growing availability in Europe of beet sugar. The plummeting prices made mortgages unbearable to many debt ridden distilleries driving most of them to bankruptcy. The surviving one had to find how to make other products form sugarcane. An obvious option was to make rum directly from fresh sugarcane juice and not from molasses, avoiding to run the sugar production process. This peculiar way of making rum helped the French West Indies producers to avoid confrontation with other island where sugar production ratios were much higher. In 1902, Martinique volcano, Mount Pele destroyed Saint Pierre and its surroundings, reducing by a half Martinique production capacities. As first World War raved across Europe, most of continental French distillery (53%) were either on German occupied territories or destroyed. France was on a verge of an alcohol shortage, as alcohol was essential for maintaining troops morale as well as producing explosive. Martinique boosted its production to attain levels which were never to be attained again. In 1918, continental rum producers began to lobby government to create taxes on imported rum. Their efforts drove to the adoption of a 1922 law restricting on a certain volume imports from foreign and non continental producers. Those restrictions were maintained until end of the second World War, allowing Martinique Rhum (as well as other kind of rums) to be freely distributed in France. During the 60's Rhum Agricole production rose to come close to traditional (industrial) rum. By 1970 Rhum Agricole production had overtaken traditional rum production on French market. There also a rum made from heated vesou also called rhum batterie, a close parent of rhum agricole where the vesou (sugarcane juice) has been heated to concentrate aromas. This rhum once a speciality of the St James Distillery has today almost disappeared. The industrial rum production process is more repeatable and guarantees a standardized output. Variability among industrial rums is more due to distillation columns and aging practices. Rgum agricole offers more variability. Each rhum agricole represents the result of a combination of influences of distillation column used and aging skills of the producer but also variability in the lands where sugarcane was grown. Fresh sugarcane juice ensures through fermentation a wider variety of aromas. Those aromas can even change through the production campaign, creating specials blends such as "Fleur de canne" (cane flower) a St James Distillery prized blend. This land caracterisation granted Martinique rhum agricole the opportunity of earning a protected designation of origin. The AOC Martinique rhum agricole also guarantees you that the color of its aged rhums come exclusively from long exposure to oak barrel wood and not from caramel as it is the cas for many indsutrial rums. "Rhum industriel", "rhum traditionnel" & "rhum grand arôme" designations. "Rhum traditionnel" and "Rhum industriel" designations are equivalent. Both of them mean that the rum was made through distillation of fermented molasses. The "traditionnel" designation being more favourably connoted, is of course more common. "Rhum grand arôme" designation indicates that the rum was produced using a mix of vinasse (residue left in a still after the process of distillation) and molasses which had been left for fermentation during a long period of time. This kind of rum therefore develops a very strong aroma. This rum is typically used in bakery and cooking. 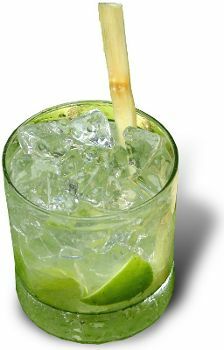 Cachaça is a brazilian spirit. The distilled liquid is a fermented mix of fresh sugarcane juice (as in rhum agricole) and roasted cereals (wheat, rice, ...). Distillation produces a 40°spirit which is immediatly bottled. Cachaça can also be aged in barrels for at least one year. Rhum is never bottled right after the distillation process. Though, use of fresh sugarcane juice and local variations in its porduction process mean that cachaça shares with rhum agricole terroir shaped spirit caracteristics. The first step in making rum is to produce alcohol. Alcohol is made through fermentation. Fermentation is a process transforming carbohydrates into alcohol and carbon dioxide, using yeasts or bacteria. Fermentation occurs when the sugared liquid is mixed with yeasts. Yeasts are of the Saccharomyces genus. Yeasts consume the sugar in the juice to produce ethanol and carbon dioxide. The sugared liquid is either fresh sugarcane juice (rhum agricole) or watered molasses (non agricole rum). The liquid produced is not very strong in alcohol (5° to 6°). 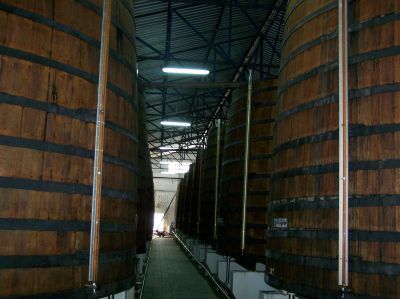 You will find more information on alcohol production by visiting the fermentation page. Next step in rum production is to concentrate alcohol by distillation. The lightly concentrated liquid produced by fermentation is distilled to obtain a 70° spirit. The liquid is evaporated by boiling and its vapour is then collected after it condenses. This process enable to isolate lighter components (alcohol, aromas) from water. You will find more information on distillation by visiting the distillation page. The 70° spirit is watered to more human compliant grades (generally from 40°to 55°). and laid to age at least 3 months (for rhum agricole). You will find more information on ageing and bottling by visiting the bottling page. Rhum blanc (white rum) is a a rhum aged at least 3 months (and exactly 3 months if aged in wood barrels) before being bottled. It's a colorless rhum, with 40% to 55% of alcohol concentration. Rhum ambré (brown rum) is a oak barrel aged rum, for at least 18 months. Another designation is "rhum paille". Rhum paille (straw rum) is another designation for "rhum ambré". Rhum vieux / hors d'age. Rhum vieux is usually a blend of various aged rums, all of them at least being aged the minimum number of years required for the designation and its eventual mention.